Copyright laws protect original musical works from unauthorized copying, sale or reproduction. Before playing a song at a meeting, the organizers should make sure that they are not contravening the composer’s copyright. Two main issues are relevant here: First, whether or not the song has copyright protection and second, whether playing it at the meeting constitutes a public performance. The applicable legal provisions are contained in Title 17 of the United States Code. Copyright exists for any original musical work from the moment it is created or fixed in a tangible medium of expression. The composer, therefore, owns the copyright as soon as he records the music in a physical format or writes the music down. A musical work, as defined by copyright law, includes any accompanying words. Although the composer owns the initial copyright, he may sell or license it to other parties. The copyright status of a song can be checked by searching the U.S. Copyright Office’s catalog of copyright entries online. For a fee, staff at the office will conduct the search. The fee varies according to the amount of work required. A musical work remains protected by copyright from the date of its creation until 70 years after the composer’s death. After this period has elapsed, the song is within the public domain and organizers of a meeting may play it without fear of contravening copyright law. Copyright laws define a public performance of music as one taking place either in a public venue or in a place where a substantial number of people -- outside a normal circle of friends and family -- gather. Organizers will breach copyright if they play copyrighted songs at a meeting that falls within this definition. A small meeting of friends and/or family, taking place at a private house where music is played, is unlikely to constitute a public performance. Playing music at a meeting in a public coffee house would likely constitute a public performance. If the organizers want to play songs at a meeting that falls within the definition of public performance, they should apply for a license from the copyright owner and – in most cases -- will need to pay a fee. 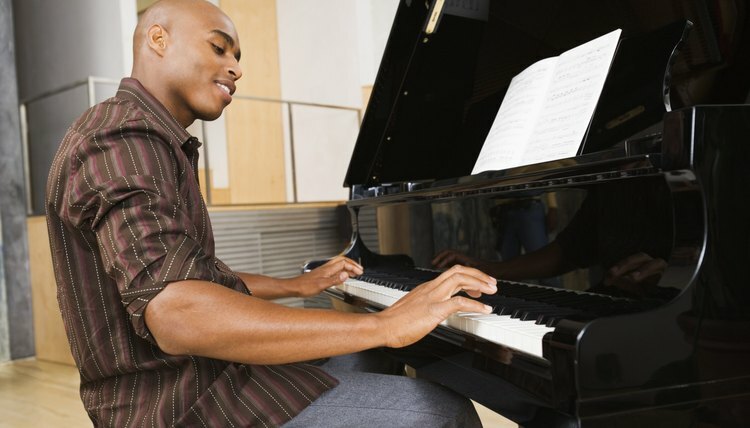 The American Society of Composers, Authors and Publishers is one of many organizations that sells and grants licenses for the public performance of songs in the United States. Original music is protected by copyright law as soon as it is written or recorded, but enforcing music copyrights can be difficult. Musicians who want to ensure the ability to bring copyright enforcement lawsuits against people who infringe on their copyrights need to register their works with the U.S. Copyright Office. Registering copyright for original music is simple and inexpensive.